Doral is a part of Miami-Dade County that has seen major growth over the past 10+ years. With the migration of domestic and international companies, Doral real estate continues to grow as developers see tons of potential in this up and coming community. The biggest attribute is the amount of home for the investment. 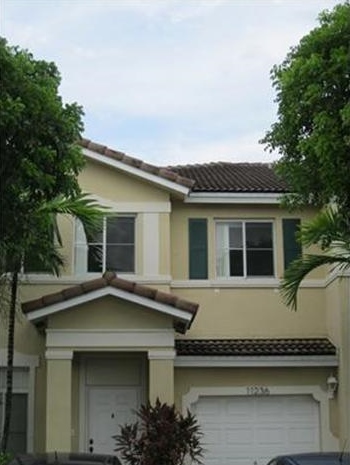 As for rental property, those wanting more property for the money should take notice of property in Doral. On a cost per square foot basis, renters can get more property. Following are the most affordable Doral rentals. This 2,800+ square foot coach home with a two-car garage is located in in Doral Isles North. With travertine tile floors on the first floor and Brazilian cherry hardwood floors on the stairs and the second floor, this home has many detailed finishes to make this a wonderful place to live. Rooms are large and offer tons of space and upgrades to make life easy. The master suite is large and has a spa-like bath with a roman tub, large shower, and granite counter tops. 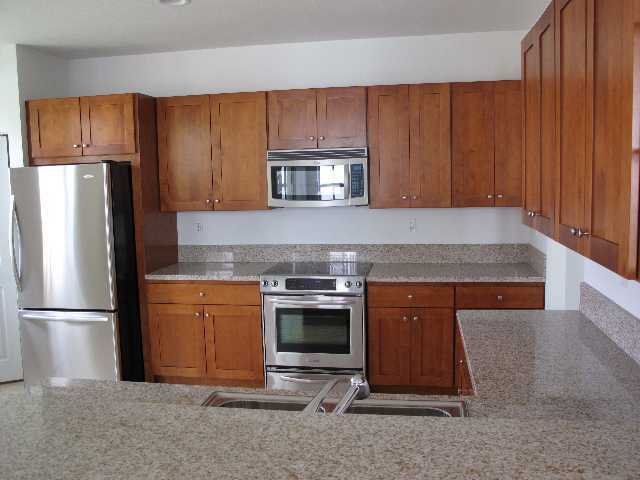 The kitchen features stainless steel appliances and lots of space to work on granite counter tops. The community is filled with extras like a tennis court, kids’ playground, community pool and other amenities. With a price per square foot at $0.99, this is definitely the most affordable rentals in one of the nicest communities in all of Doral. As one of the best homes in one of the most popular communities, this is definitely one of the most affordable Doral rentals. This corner unit has a two car garage; a large kitchen with stainless steel appliances, granite counter tops and tons of space to prepare amazing meals; a large master suite with his and hers walk-in closets; and, spacious room under 2,673 square feet. The Reserve at Doral has tons of amenities including a great resort-style pool, gated entrance, fitness center, great clubhouse and more. With easy access to the major thoroughfares in and out of Miami-Dade, The Reserve at Doral is close to shopping, Miami International Airport and Downtown Miami. This rental is one of the best deals in terms of location and price per square foot in Doral as well as The Reserve with a $1.03 price per square foot. 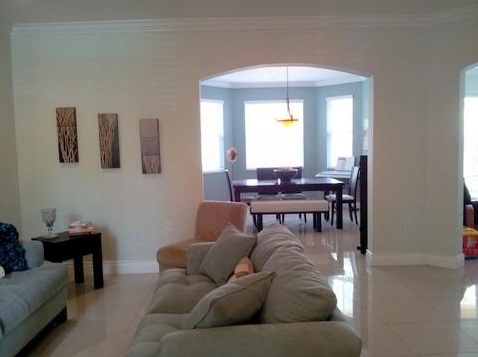 This annual rental is situated in Costa Linda - a neighborhood that sits across from Doral Park. Close to area golf courses, shopping, and the major thoroughfares, this townhouse features three bedrooms and two baths, a nice updated kitchen, new carpeting and paint throughout and spacious living areas. Community amenities like a nice clubhouse and pool make living here like living on vacation all the time. 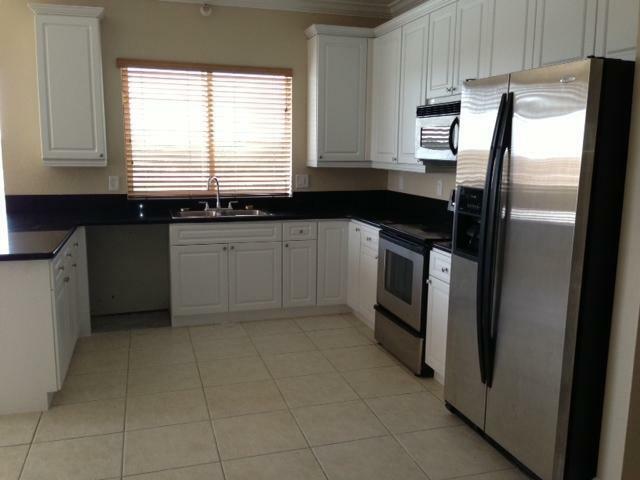 The three-bedroom/two-bath residence has a cost per square foot at only $1.03 and no last month deposit is required at lease signing, this is a very affordable annual Doral rental. As the largest unit in Captiva, this renovated condo sits on the lake in the community providing tranquil surroundings. With stainless steel appliances, vaulted ceilings, arched doorways, hardwood and tile flooring, this three-bedroom/two-bath condo is located in a wonderful family oriented community. Amenities include a community club house and pool, children’s playground, and more. Located close to major thoroughfares and some of the best golf courses, this unit is priced at a mere $1.04 per square foot per month for an annual lease. Encompassing over 2,000 square feet of living space, this lovely townhome in the community of Sonoma offers three bedrooms and two and a half baths with a half bath on the first floor. The home includes wonderful fixtures and finishes including a one-car garage, tile and carpet flooring, a large kitchen with tons of counter space and an island, large rooms and a traditional architectural style. Community amenities include a guard-gated entrance, guest parking, children’s playground area, a community pool and more. Located in the heart of Doral, this community is close to excellent golf courses, shopping, dining and the major thoroughfares throughout Doral and Miami-Dade County. 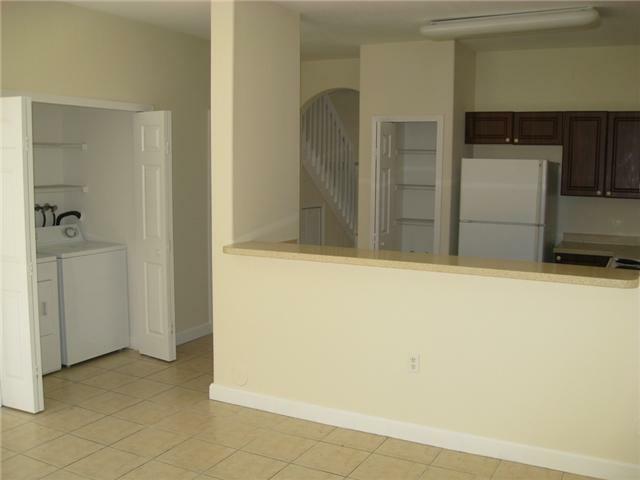 This townhouse is available on a monthly basis and has a cost per square foot of only $1.07. There is a wide array of Doral rentals available with different attributes. From smaller condominium units to elegant estate-like homes, the monthly price per square foot costs fall within a broad range of prices. Unlike many other areas of Miami-Dade, Doral makes it easier to get larger properties for the investment. Thanks for the heads up. Having the most affordable rentals can provide the best help for people wanting to have a great property.